Still, as it has been traditionally, the CX-5 is still my favourite model in this very crowded market niche. 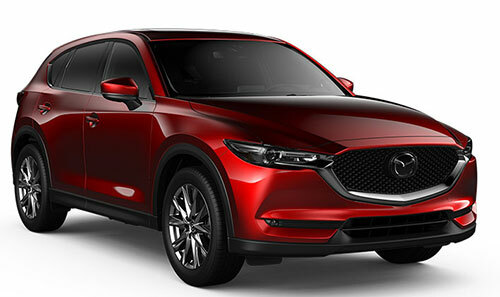 The CX-5, Mazda says, is the company's best-selling vehicle (more than two million have rolled off the company's assembly line) and they also claim to have listened to customers' wants when planning this upgrade. They also say they "strove to create an SUV that enlivens all who ride in it…focused on improvements of a premium high-quality interior, refined powertrain and enhanced chassis." It isn't just smoke, either. As before, the CX-5 is better to drive than most, if not all, of its direct competition, and it also features an interior that looks and feels richer than it has any right to. In other words, it's a typical Mazda. I really don't understand why Mazda isn't a much bigger company. The base GX model, which starts at $27,850 according to Mazda's Canadian website, gets its motivation from what's now the base engine, a 2.5 litre unit that cranks out a decent 187 horses @ 6,000 rpm with a torque rating of 186 lb.-ft. @ 4,000 rpm. It isn't overpowering but when combined with the basic goodness of the structure and underpinnings – and its slick transmission – it's fine. The GS and GT trim levels get the same engine, but it features cylinder deactivation that should help increase your fuel mileage if you lift your foot from the gas pedal. Ah, but that 2.5 litre turbo, found on the Signature trim level (and optional on the GT), is a lovely piece of engineering. Mazda claims 250 horses @ 5,000 rpm (if you use 93 octane fuel, and you'd have to be some kind of nut to spend all that extra considering the "regular" unleaded stat of 227 horses @ 5,000 rpm is still darn fine in this region of the market. Then you have to consider the torque, which is the force that pushes you back into your seat and puts the big grin on your face. The Dynamic Pressure Turbo engine is rated at a wonderful and heady 310 lb.-ft @ a low, low 2,000 rpm. Yessiree, folks, that's not only "Zoom-Zoom" it's "Fun-Fun!" – and, as it did when I sampled the engine in the CX-9 and 6 sedan, it put a big enough smile onto my face that my wife wondered what I'd been up to. Torque comes on quickly, obviously, and there's little lag. Adding to the CX-5's goodness is an independent suspension (MacPherson struts up front with a multi-link bum) and rack and pinion steering that nearly feels wired into your skull. You also get a slick, six speed automatic transmission that shifts very nicely, though if you put the vehicle into sport mode and don't drive it "spiritedly" you might find it hangs onto gears longer than you like (solution: drive spiritedly!). The four-wheel disc brakes (with ABS etc. of course) work just fine, with nice pedal feel and good stopping power. And of course, Mazda's G-Vectoring Control Plus system helps you keep all four wheels gainfully employed when you hit those serpentine sections of road (or just zip around an on or off ramp). The new Signature level also ups the creature comforts ante, not that it really needed it. But now, for a price starting at $40,950 Canadian (which I admit is starting to get up there), you also get premium materials such as Cocoa Brown Nappa leather and Abachi wood trim. It also has a 10-speaker Bose audio system, automatic dual zone climate control, 10-way powered driver's seat with memory (six way power for the front passenger), heated front/rear seats with cooling up front and a heated steering wheel. That heated steering wheel feature may sound a little silly but over the past few years I've winter driven an increasing number of vehicles that offer it (I don't like driving with gloves on unless they're thin driving gloves) and it's to the point now that were I buying a new car in this climate, I'd insist on one that has this feature. Anyway, the Signature CX-5 also gets 19-inch alloy wheels, a power moonroof and tailgate, LED head and fog lights up front and LED rear lights. There's also heating for the windshield wipers (another feature I expect will be legislated eventually…) and power folding outside mirrors. You also get Mazda Radar Cruise Control (which in non-corporate speak is "adaptive cruise control"), forward sensing pedestrian detection (but no cowcatcher…), shut offable (and it stays off!) lane keeping assist, and high beam control. There's also a frameless inside rear view mirror, a seven-inch TFT display in the gauge cluster, wood trim and Apple CarPlay and Android Auto. Lest this review be deemed a hagiography, the CX-5 is definitely not perfect. Therefore, for some reason that flies in the face of "Zoom-Zoom," you don't get paddle shifters (there's a manual mode on the centre console, of course, using the shift lever, but paddles are better) and, for those who love to carve a few curves in snowy parking lots, there's an electronic parking brake instead of a handbrake! What's with that? Mazda's infotainment system also needs work. I liked it when it first came out, but that was then and this is now. The system works fine, but it takes forever to fire up when you start the vehicle and the big LCD screen atop the centre stack only works as a touch screen when you're stopped (it's also a tad far away for my stubby little tentacles). There's a knob/controller thingy down on the centre console, along with a volume control knob, and they both work fine but the interface itself is rather clunky compared to some of the competition. These things would not be a deal breaker for me, because I love Mazdas and am willing to make certain "sacrifices" to drive one. Naturally, your mileage may vary. I loved driving the CX-5 – which didn't surprise me a whit – and were I looking for a new SUV/crossover in this market niche it would be my first test drive. However you want to slice it and whichever trim level/price appeals to you the most, there's a whole lot of goodness with the CX-5, and some of if is also available on lower models (some as options, some not). But I find the Mazda interior more pleasing than the others – it's very nearly the stuff of luxury brands – and if you like to drive, you'll definitely want that marvelous turbo! Last week I recounted my journey to Kia's product introduction brunch, at which time they unveiled the new Forte5, Niro EV, Soul and Telluride full size SUV. All are impressive vehicles but missing from the introduction was any official pricing. Since then, Kia Canada released the prices for the big Telluride, and I have to admit to being very surprised, pleasantly. I figured then that "it'll be priced in the approximately 60 grand range, right where such other 'higher end but not supposed luxury' models…live." And I thought that would be a fair deal. Enter Kia to surprise me again. According to their release of March 20, the mighty Telluride will be an even better deal than I'd thought: the base Telluride EX AWD will start at $44,995 CAD, the mid-range SX AWD will list for $49,995 and the top line SX Limited AWD will top the line at $53,995 when it's introduced "later this spring." That sounds like a heckuva deal and if the Telluride turns out to be as nice as it seemed at the event, they may start flying from Kia dealerships.